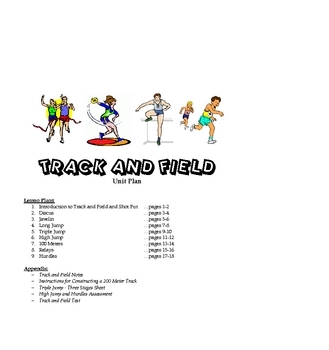 This 27 page track and field unit includes 9 detailed lesson plans: Introduction to Track and Field & Shot Put, Discus, Javelin, Long Jump, Triple Jump, High Jump, 100 Meters, Relays, and Hurdles. 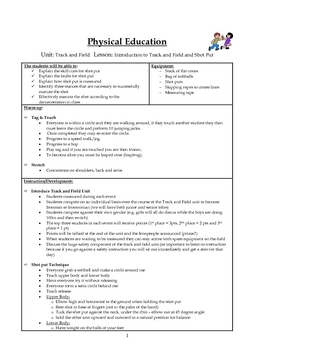 Each lesson plan includes a warm-up game, instructional/ developmental activities, and a culminating activity. Diagrams are included for many of the games/activities. 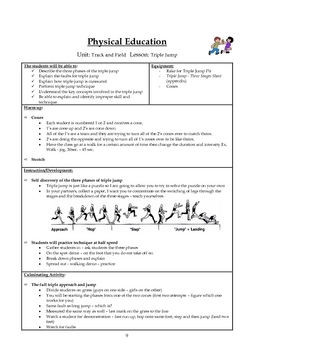 The following resources are included in the appendix: Track and Field Notes, Instructions for Constructing a 200 Meter Track, Triple Jump - Three Stages Sheet, High Jump and Hurdles Assessment and a Track and Field Test.